Construction & Tenants: Look Forward to Fall 2015! Completion of the two residential towers is on track for Fall 2015! 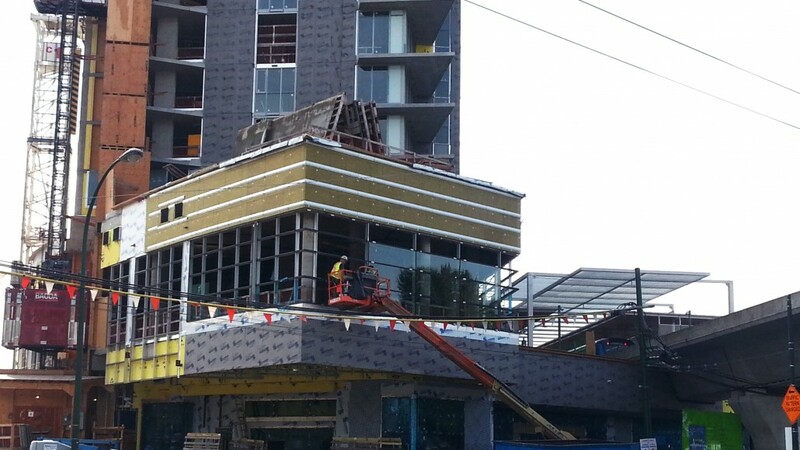 Commercial tenants are scheduled to open by late 2015. – North residential tower is up to Level 22. – South Residential Tower is up to Level 24. – The office building has been poured to Level 10. – The east and west retail podiums are fully formed. – Installation of windows and glass facade has commenced on residential towers and along ground floor retail at Cambie and Marine Drive. View from Canada Line – Office at left, residential at right, retail at bottom. Marine Gateway is pleased to welcome all our retailers so far! In addition to Cineplex’s eleven screen movie theatre will be a new OSAKA Grocery store, T&T’s sister store bringing the taste of Asian cuisine to the Cambie Corridor. Just steps away you can grab something to eat at Starbucks, Subway or A&W. Enjoy a hearty meal and drink at the Irish Pub or pick up something from the Cambie Marine Liquor Store. You can manage your finances with our banking network of TD Bank, CIBC and the Bank of Montreal. The convenience of BCAA is close by, along with Marine Gateway Dental and medical offices. We hope to announce shortly a major fitness centre provider as well as other restaurants, retail shops and entertainment. https://marinegateway.com/wp-content/uploads/2014/08/Augst-22-2014-Construction-Tenants-Header.jpg 1836 3264 adminMG /wp-content/uploads/2015/04/mgLogoSpace.png adminMG2014-08-22 07:09:552015-07-17 18:10:19Construction & Tenants: Look Forward to Fall 2015! Vancouver’s future shaped by an explosive demand for transit The Millennials are here, but are we ready?